I learned chess when it was introduced by a classmate in our first year high school. Back then, it was a popular event in our school's annual Sportsfest. Immediately then, I got hooked to it. I introduced it at home and in a short time, my elder brother became my chess rival at home. I would skip meals playing it; I would go to barber shops and sidewalks to watch chess games. I would spend whole days to watch tournaments. I would even skip my homework and studies to play chess.And I would read chess books, trying to understand Sicilian, King and Queen Gambit Decline, all those opening lines and end games tactics. I would also search for news articles, biographies of great chess players, etc. That's how I came to know Murphy, Capablanca and their contemporaries, to Botvinnick, Tal, Petrosian, Spassky, Gligoric, Portisch, etc. And yes, most especially the mercurial American genius, Bobby Fischer (I would later find out that my father-in-law kept a lot of books on chess, especially on Bobby Fischer), my idol. But of course, my era includes Karpov, Kasparov to Anand, Kamsky, the Polgar sisters,etc., including those upcoming Chinese and Vietnamese top young grandmasters. Until now, I still read with interest and enthusiasm news about chess. It pains me though that many big tournaments, local and especially international, do not merit due space in both print and broadcast media. It was not unnatural therefore that I taught chess to my kids early on. My eldest kid learned chess before he went to Grade 1. 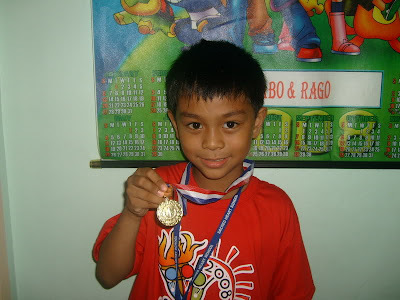 When he was in Grade 3, he became their level (5 sections per level) champion. Unbeaten, he proudly said. My other younger kid almost learned it by himself. My wife and I were then amazed that he learned it by just watching me and his Kuya play. At kindergarten, I underestimated his capacity to understand how the Knight moves, how powerful the Queen is, how to checkmate an opponent in a King-Rook endgame.etc. Now, he beats his older brother with regularity. But now that they both know how to play, I don't encourage, much more push them to go seriously into chess. I don't want them to spend much time studying and playing and the game. It's enough that they know how to play and if on their own they can still improve without those long hours of analyzing games, it would already be a bonus to me. I know how it is to be serious here. It can be addicting, and you can forget about everything else. Here's my son showing off his gold medal in chess. I seldom play chess now. I just content myself comfortably watching and analyzing games, and reading developments of the game. I'm happy that now, we have already a double-digit number of grandmasters. Time was when our national team would play in the Chess Olympics with only Eugene Torre in Board 1 as Grandmaster and the rest international and national masters. There, they would pit themselves against an all Grandmaster (including reserves) line-up from chess giant countries in Europe and Americas. With proper support, effective program and inspiring leadership, we could discover more Torres, Balinas, Cardoso, Antonio, Gomez, Paragua, etc. and, much more, hopefully more Wesley Sos.